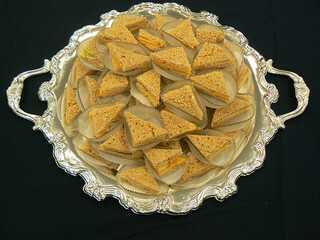 Pullman Loaf pans are bread pans with lids on them so that the loaves of bread bake perfectly square. This is the kind of bread that lovely tea sandwiches are made with. Blend the flour with salt. 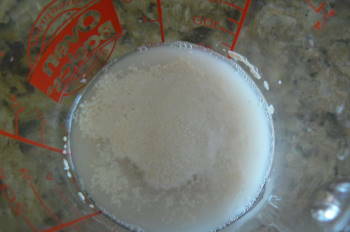 Dissolve the yeast in the 1/4 cup water with a little pinch of sugar to help the yeast activate. Simmer milk and butter together until the butter is melted. 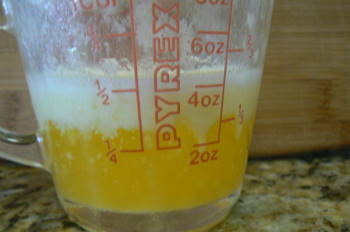 Cool to room temperature and add the whole egg, whisk well and set aside. Whisk sugar and salt into the flour and then add the milk/butter mixture. Add the activated yeast. Stir well with a wooden spoon or use a heavy duty mixer with a hook attachment to blend the mixture together. Turn out onto a clean surface that is well dusted with flour and knead for 10 minutes. Let rise for 4 hours. Knock down and shape into a loaf. Place bread into a buttered Pullman bread pan that and allow to rise for 1 1/2 hours to 2 hours. Bake covered with the Pullman lid for 1 hour at 375 degrees F.
substitute honey for the granulated sugar. Replace one cup of all purpose flour with 1 cup wheat flour. Substitute 1 cup of all purpose flour with 1 cup of rye flour. Add a Tablespoon of dill to the milk/butter mixture. A very nice person had a difficult time with this bread formula. I have modified the bread formula by changing all purpose flour to bread flour and I have added 1/2 cup extra flour. I also am suggesting that you dust your clean surface with flour when you knead the dough. The bread flour has a higher protein content and a higher absorption level. The bread is still sticky. I prefer wet dough which can be finessed with the addition of flour worked in on your clean surface. For those of you who do not have a heavy duty stand mixer, a bowl and a wooden spoon work well, however, you will have to knead the dough for at least 10 minutes on the table.. Make sure your work surface is well dusted with flour. Here are photos of the process. 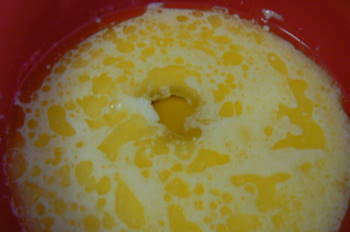 Whisk together the egg, milk and melted butter. white bread flour, whole wheat bread flour, salt and sugar in the bowl of a heavy duty mixer. This is blended together either with a whisk or by turning the mixer on low with the hook attachment. 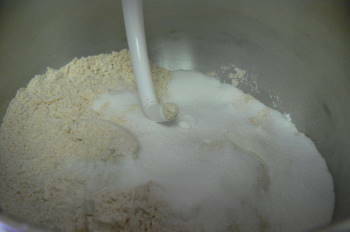 Working the dough in a heavy duty mixer with a hook for about 6 minutes will start to develop the protein in the flour. You can mix this bread dough in a bowl with a wooden spoon and then turn out the dough on a clean surface to knead the dough for about 10 minutes. There is a considerable amount of friction created in the heavy duty mixer which warms the dough slightly. 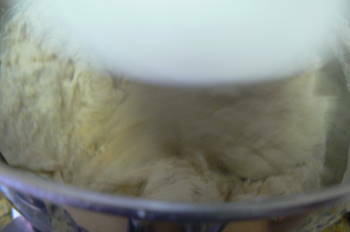 The ideal temperature of the dough should be about 75 degrees F.
This is the activated yeast. If you wish, you do not have to activate yeast in warm water at all. You can simply add yeast directly to the dough, but if you do, it is better to add the dry yeast to the flour with the sugar only. Leave the salt out until the whole is blended well together. You can even allow your dough to rest for 20 minutes before putting the salt in and that will prevent the salt from adversely affecting the yeast in the dough. 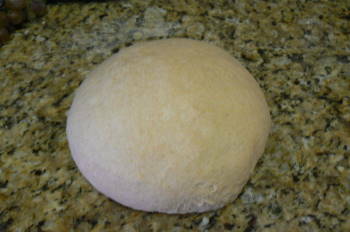 Here is a nice ball of dough with a few minutes of kneading on a surface covered lightly with flour. Learning how to finesse bread dough is essential to good bread making. If the bread is too dry, add a bit of moisture to it and if the bread dough is too wet, work some flour into it. I tend to prefer wetter doughs as they rise well and make lighter loaves. This is a wet sticky mess if you ask me. I tried it as above. Added 1/2 C more flour and still too wet. You evidently did not use this recipe for your final picture. I have been baking that formula for over 30 years and it has always worked for me. That photo is the bread formula and I will make one now, photograph it and show you..